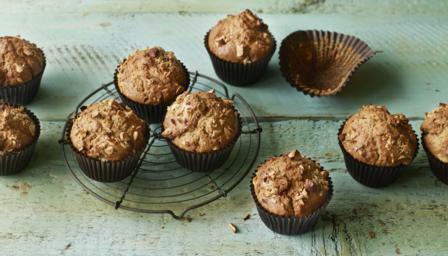 Taking tea in muffin form seems ideal for breakfast, and the warm spices of chai bring scented richness without heft. I’ve made these dairy-free, but if you want to, you can easily use semi-skimmed milk in place of the almond milk. I want to make it as easy as possible for you to make these, as this is a particularly splendid specimen of muffin. Warm the almond milk with the contents of the 2 teabags (I just rip them open over the pan) and cinnamon – stirring to mix – and leave to cool. While the milk’s cooling, preheat the oven to 200C/180C Fan/Gas 6 and line a 12-hole muffin tin with paper cases. In a large bowl, measure out the flour, baking powder, sugar and all but 2 tablespoons of the chopped almonds, and combine well. When the milk has cooled, add the eggs and oil, then whisk well. Add the liquid ingredients to the dry ingredients, using a wooden spoon. Don’t be too efficient about this: a slightly lumpy batter makes for lighter muffins. Divide the mixture between the muffin cases (it will fill them well), then sprinkle equally with the remaining almonds and bake for 20–25 minutes, or until a cake tester comes out clean and the muffins are slightly risen and pleasingly golden-brown on top. Remove to a wire rack to cool for about 10 minutes before devouring.